This hotel has a capacity of 102 beds. It was built in 1991 and then renovated. It consists of 42 apartments, 24 (Studios) and 18 (Apts), 4 of which are maisonettes. It has reception desk, main bar, snack bar / restaurant, garden and recreation area with pool, children’s pool, playground, changing rooms, sunbeds, umbrellas and meeting room. There is an indoor dining room and a covered terrace by the pool and in the front of the hotel where you can enjoy breakfast, lunch or dinner. Reception works 24 hours every day. 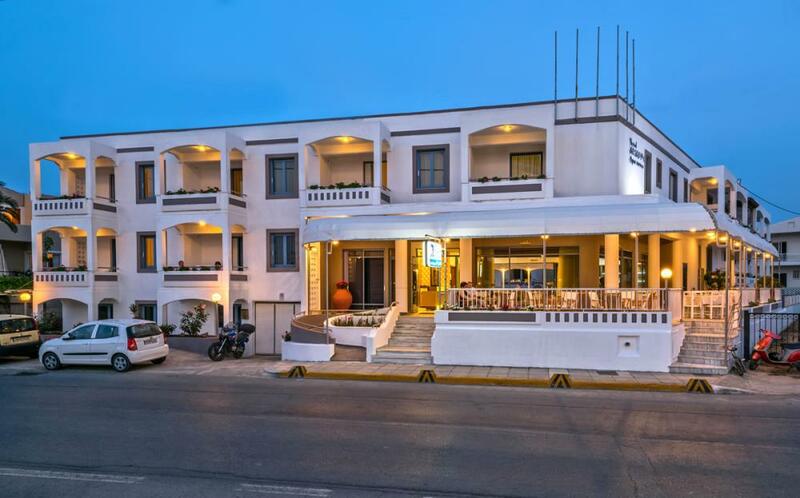 The hotel authorized from Greek Tourist Organization at the class of 2* from 30/3/2015, but after the renovation of last year has the specifications of a 3* hotel, as all the tour operators describe. According to the Greek law 4389 of 2016, from 1/1/2018 there will be a tax for the stay in the greek hotels which in our hotel will be 0,5 euro per day. This tax is paid at the departure of the customer and it cannot be paid at the reservation time. 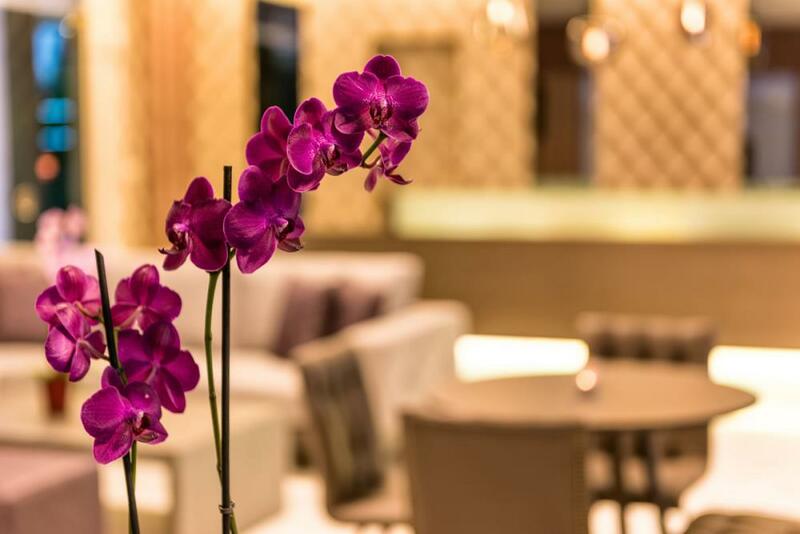 Reception lounge, reception desk, breakfast area, TV, Video-wall, Wi-Fi in the lounge and the swimming pool, Main Bar, Snack Bar / Restaurant, pool terrace / sitting area, terrace restaurant, swimming pool, children's pool, sunbeds / umbrellas, changing rooms / shower, WC, meeting room. The sandy beach of Platanias, welcomes you with views of the town of Rethymno and the deep blue of the Sea of Crete. It follows the coast of the town, stretching 13 km along the east, to Scaletta. It is organized with lifeguards, water sports, sunbeds/umbrellas, changing rooms / showers, café, snack-bar/restaurant etc. It is 150 meters from the hotel, just a 2 minute walk on a pedestrian walkway under beautiful palm trees to the beach. Around the vicinity you can find super markets, shopping stores, souvenir, jewellery, leather goods and fur shops, restaurants, cafes, bars and nightclubs for your entertainment, ATM for banking transactions, Radio Taxi and rental car companies. There is bus service for the city of Rethymnon from early in the morning until after midnight. Bus stop is 150 meters from the hotel entrance. The reception staff will give you all information and the time table of the routes. The distance from the hotel to the middle of the town is about 5 kms and duration less than 15 minutes. The Arkadi Monastery is located 23 km from Rethymnon. It was built during the last Venetian period and it consists of a large set of fortress-like buildings. The most important part of the Monastery is the central church which has two naves dedicated to the Transfiguration of Christ (the one nave), and Saints Constantine and Helen (the other nave), surrounded by thick courtyard walls inside of which there are several auxiliary buildings. Eleftherna is the most important archaeological site in the prefecture of Rethymnon. The University of Crete has been making systematic excavations every summer since 1985 and the findings so far are many and impressive. It was inhabited continuously from the 2nd millennium BC until the later Roman, pre-Byzantine and Byzantine years (13th century AD). Advantages of the place were its fortified position, the good climate and generally the existence of all conditions for habitation (sources of water, arable land, land for grazing and logging, limestone for building). Since the summer of 2016 operates the new impressive museum of Eleftherna. The distance from the hotel is 15 kms only. Kournas Lake is the only freshwater lake in Crete. Kournas Lake was known as Lake Korisia in antiquity, but later took its current name from the Arabic word for lake. The lake is in a beautiful landscape, lying in a valley among the hills, about 4km from Georgioupolis in Chania Prefecture (western Crete). Kournas Lake is relatively small with a maximum length of 1087 meters and a maximum breadth of 880 meters. It covers an area of 579,000 sqm and is generally shallow with a maximum depth of 22.5 meters at its deepest point, while it lies approximately 20 m above sea level. Samaria Gorge is located in Crete, in Chania Prefecture. It is the longest gorge in Europe, with a length of 18 kilometres. It has been a National Park since 1962 and it is home to many endemic species of birds and animals, the best known of which is the wild goats of Crete, known as Kri-Kri. Its name comes from the abandoned village of Samaria, which owes its name to the church of Saint Mary. During the Ottoman rule, rebels and the local population sought refuge there. Panormos was previously a town but today it is a small village. It is located in the north coast of Crete in the prefecture of Rethymnon, 22 km from the town of Rethymnon. The village and the surrounding area have many attractions to visit. One of the most important is the early Christian basilica of St Sophia. It is the largest Christian basilica in Crete, a building of the early Christian period (5th century), excavated in 1948. Upon arrival, the Hotel Ariadne is at your disposal. This is a complex of 42 apartments, consisting of 4 wings sited around the pool. All studios are 25 sqm with garden and swimming pool view and have in an open-plan area: room modernly furnished with 2 beds, 1 sofa / bed, wardrobe, safe deposit box, bathroom with shower, kitchenette, dining area, air condition, hair dryer, telephone, TV LCD 32’ with satellite channels from all European countries, electromagnetic key switch and balcony with window flower boxes. All apartments are 35 sqm with garden or pool view, to the mountain or to the sea. They have a bedroom and a living-room with modern furnishings. Bedroom: 2 beds, wardrobe, safe deposit box, luggage area, hair dryer and telephone. Living-room: 1 bed, 1sofa / bed, kitchenette, dining area, bathroom with shower, air condition, TV LCD 32’ with satellite channels from all European countries, electromagnetic key switch and balcony with window flower boxes. 1st level Living-room: 1bed, 1sofa / bed, kitchenette, dining area, WC, staircase, air condition, telephone, TV LCD 32’ with satellite channels from all European countries, electromagnet key switch and balcony with window boxes and flowers. Around or near the hotel, you will find super markets and other stores for shopping, cafes, restaurants, bars and nightclubs for your entertainment, ATM banking, public bus service to town every 20 minutes, long distance bus transport to Chania or Heraklion every 1 hour and regular bus services to South Crete and other destinations. At a distance of 15 kms operates the museum of Eleftherna. Access to Crete and Rethymnon can be done by plane or by ferry through Heraklion or Chania. The distance of the hotel from the two airports is about the same (80 km from Heraklion and 78 from Chania). The distance from the port of Heraklion is also 80 km and from Chania (Souda), is about 60 km. There is daily ferry connection between Piraeus and the two ports of Crete, Heraklion and Chania (Souda). Also, the air link with Greek and European airports is continuous with regular and charter flights. 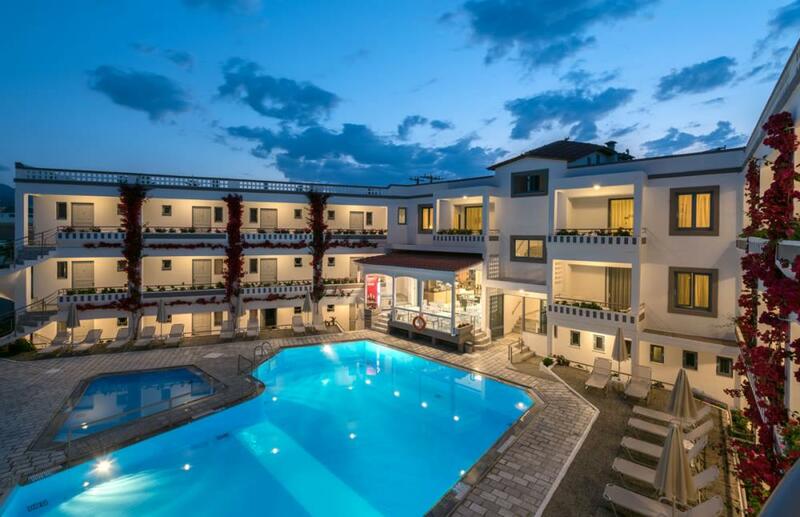 The sandy beach of Platanias welcomes you with views of the town of Rethymnon and the deep blue of the Sea of Crete. It follows the coast of the town stretching along the east 13 km to Scaletta. It is organized with lifeguards, water sports, sunbeds/umbrellas, changing rooms / showers, café, snack-bar/restaurant etc. It is 150 meters away from the hotel, just a 2 minute walk on a pedestrian walkway under beautiful palm trees to the beach. The popular, sandy beach of Rethymno extends 13 km east to Scaletta. It is well organized with lifeguards, water sports (water skiing, jet skiing), sports (beach volley), sunbeds/umbrellas, changing rooms / showers, café, snack-bar/restaurant, etc. Episkopi beach is located west of the town of Rethymno and extends 10 km in length from Petres to Georgioupolis. It is also very close to Lake Kournas. Preveli beach, which is near the famous Monastery of Preveli, is located 40 km south of the town of Rethymnon. It is the most idyllic beach of Rethymnon prefecture and you will certainly be enchanted by its exotic beauty! Crystal clear waters, the outfall of River Kourtaliotis, wild vegetation and palm trees, are some of the elements that create a dreamy landscape. Triopetra beach is located 50 km south of the town of Rethymnon, near the village of Agios Pavlos. It took its name from the three imposing rocks found on the coast. It is worth visiting to admire the sunset. Schinaria beach is located 33 km south of the town of Rethymno and 3 km south of Lefkogia village and belongs to the area of Plakias. The beach is relatively unknown to most people, but for many it is an earthly paradise and do not hesitate to rank it as the best beach of Crete. The beach of Plakias is 35 kms far from the town of Rethymno, in Southern Crete. It’s sandy and well organized . In the village you can find a lot of tavernas and shops. Another one great beach in the South Creta. It is 34 kms far away from the town of Rethymnon. It iw well organized, and has also sea sports. The fishing village of Bali ιs 31 kms far away from the town of Rethymnon, in the north side of the island. It has a lot of small sandy beaches and is ideal for excursions and swimming.